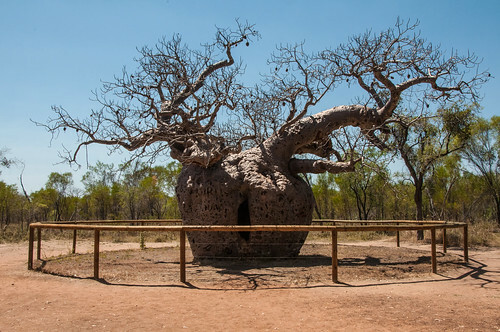 This strange looking and huge Boab tree (Adansonia gregorii) near Derby, Australia is said to have been used by police in late 19th century as a lockup for Indigenous Australian prisoners on their way to Derby for sentencing. It is now a tourist attraction. The tree has a diameter of about 14 metres and is reportedly 1500 years old. Boab trees are one of the most strange tress in the World. The common name "boab" is a shortened form of the generic name "baobab" (genus Adansonia) native to Madagascar, African mainland and Australia. Baobab reach heights of 5 to 30 metres and diameter of 7 to 11 metres. Each tree can store up to whopping 120,000 litres of water inside the swollen trunk. The baobabs generally have life span few thousands of years. Here is a tree in Madagascar and it is reportedly 1000 years old.